This post is meant to accommodate the Monthly Humble Bundle Threads. Please look here for questions you may have before asking on the bundle thread itself :) Thanks! Q1: When does this bundle go live? Q2: I heard you can sign up for a variety of monthly plans now? A: Yes! You can now subscribe to 1-3-6-12 month plans .. BUT the caveat is that you have to pay UP FRONT, meaning if you get the recurring 12 month plan, you MUST pay for the whole year (meaning you must pay 12 x $11 = $132 all at once). If you are unsure of whether or not you would like to get a bundle, I would highly suggest getting the recurring 1 month plan. That way, you can save money by skipping bundles if you decide you do not want them. Q3: Can I just skip this upcoming month's bundle, and still get next months bundle? Is there a PAUSE option for subscriptions? You can PAUSE your subscriptioin for 1 month, and it will automatically resume the following month (i.e. Pause subscription so you don't get October bundle, but your subscription will resume for the November bundle). user espo states: "You can pause the subsciption for one month now. 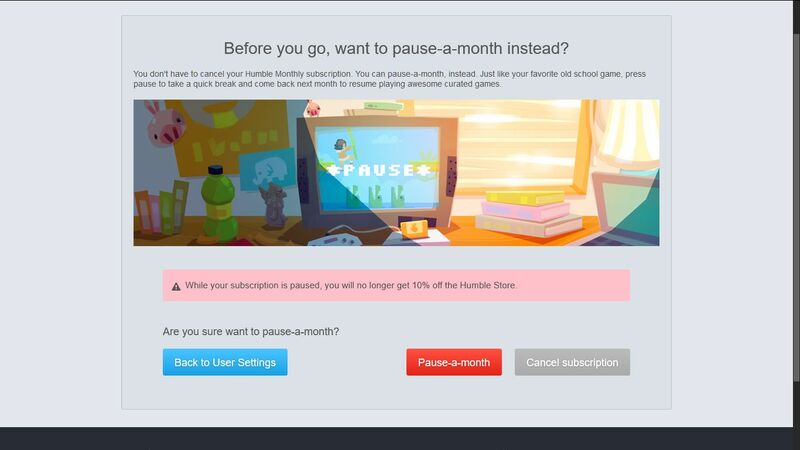 It will automatically continue next month ..." ... "you can unpause the subscription whenever you want." You will still get to keep the 10% discount for HB STORE purchases if you PAUSE your subscription. Q4: How does this 10% off coupon work? Does it work for 1st time subscribers only? What about current subscribers? See the COUPON FAQ for more information! Note: There are coupons currently only for FIRST TIME SUBSCRIBERS. A: You CAN use the 10% off coupon ONLY if you are a NEW subscriber. If you have subscribed before on the same account or are an existing subscriber, you can NOT use the New Subscriber coupon. They autocharge you $10.80 (if you have the coupon) one week before the bundle goes live, or you can pay early to get the the featured unlock game and still get the bundle for $10.80, or if not subscribed, pay with the coupon anytime before the bundle goes live. If you pay $12* for next month's bundle, you will get a key for the featured game immediately. If you wait for the OCTOBER bundle to launch on Friday, OCTOBER 7th), you will get a key for the game when it goes live, or if you are a subscriber, you will receive a key for the featured game when you are charged one week in advance on September 30th. Q5: If I've subscribed before, maybe I can just unsubscribe and then resubscribe to use the NEW subscriber coupon? A: Unfortunately. THIS DOES NOT WORK. I repeat, UNSUBBING AND RESUBBING DOES NOT WORK. (This has been confirmed many many times that it does NOT work). You have to create a new account in order to use the coupon, and you can NOT transfer coupons between accounts. If you want to use the coupon, you'd need a new account with the NEW subscriber coupon. Otherwise, you'll have to pay the full price ($12). Q6: "When is the latest I can unsubscribe (if I am a [re]current subscriber) to avoid being autocharged for the next month's bundle (NOVEMBER) if I subscribe for this one now?" A: ONE WEEK before the next bundle goes live, you will be autocharged if you are currently subscribed. This means you will be autocharged SEPTEMBER 30th if you want the OCTOBER MONTHLY BUNDLE. I recommend unsubscribing/canceling subscription right away if you know you don't want next month's bundle. Alternatively, you can also opt to pay for a ONE MONTH PLAN so that you only get the OCTOBER Bundle. Q7: BUT WAIT!! I decided that I do want the OCTOBER bundle and it has passed SEPTEMBER 30th...! Can I still get it?? HOWEVER, if you want JUST the OCTOBER bundle, subscribe for it NOW, PAY, and IMMEDIATELY UNSUBSCRIBE/CHOOSE A 1 MONTH PLAN so that you DO NOT get charged for the OCTOBER bundle. Now, with the new monthly payment plans, you can opt for 1-3-6-12 month plans (see first Question above for mor information). Your LAST day to get the OCTOBER bundle is OCTOBER 7th BEFORE 10AM PDT. Q8: Can I unsubscribe right away if I just want the OCTOBER Bundle? A: YES, you can unsubscribe away if you just want the OCTOBER bundle. You will get the featured game + Everything else that will be in the bundle once it goes live. Now, with the new monthly payment plans, you can opt for 1-3-6-12 month plans (see Q1 above for more information). A: You MUST unsubscribe 1 week before the bundle goes live to avoid being charged for the NOVEMBER bundle. (Or, you can choose to sign up for a 1-month only plan). Otherwise, you will be autocharged if you are currently subscribed on SEPTEMBER 30th if you are getting the OCTOBER MONTHLY BUNDLE. Q10: Will I get everything inside the bundle if I subscribe just for JUST the OCTOBER monthly bundle/choose the 1 month plan, and then unsubscribe right away? A: Yes, you get the entire OCTOBER bundle and won't be charged for the next (NOVEMBER) bundle. Q11: Do they reveal games early? A: NO. They do not provide hints. Sometimes they may, but this is very RARE. One or two days before, they will reveal a Humble "Original," which is an exclusive DRM-Free game provided only by Humble Bundle. However, they DO NOT REVEAL GAMES BEFORE THE BUNDLE GOES LIVE. Q12: Will I still get the Early Unlock game(s) if I don't want to pay early for the bundle? Will I be able to get the game if i buy it NOW before the bundle goes live? A: YES. ANYONE who buys the bundle, whether you pay early, have a current subscription and let HB autocharge you 1 week before the bundle goes live, or don't have a subscription but decide you want to purchase the bundle, AS LONG AS YOU PAY FOR THE BUNDLE ANYIME BEFORE THE BUNDLE GOES LIVE, YOU WILL GET THE EARLY UNLOCK GAME. The only benefit to paying early is getting a Steam key for the early unlock game earlier than people who choose to pay later on. Q13: How do I subscribe again? Or... How the heck do I cancel my subscription? How do I view what kind of plan I have for Monthly Bundle Subscriptions? A: go to your ACCOUNT SETTINGS and check to see if you are subscribed for the monthly bundle. NOTE: If you cancel your subscription, you will no longer save 10% on every Humble Store purchase. You can also switch your billing information in your user settings under the "Payment Information" section. Q14: After the monthly bundle goes live, can I get a refund for the bundle? A: No, you will not be eligible for refunds after the games have been revealed. You can try to contact support and request a refund, but you probably won't get your money back after the bundle goes live. If I'm not mistaken, you can only get a refund if you request one 1 WEEK BEFORE THE BUNDLE GOES LIVE (SEPTEMBER 30th for the OCTOBER Bundle). Closed 2 years ago by rachellove.